Keywords: additive, grease, superhuiles, lubrication, life, drain, synthetic oils, testing, testing, standards, Electrosyntec. Advantages of this 0W 20 ADP? No wear at startup, an extreme friction reducing additive that facilitates the work of the starter and allows a gain between 2 and 5% power and finally, a film withstand in extreme conditions thanks to very high temperature special esters from applications US space. To replace these good metals, additives of the past, a new technology was invented that also allowed consumption gains up to 3%. On the other hand, the reduction of oil consumption to respect the long oil change intervals and the environment requires a gain of 23% of evaporation losses compared to other synthetic oils. In addition, the absence of zinc and other heavy metals ensures a longer period of efficiency for particulate filters and catalysts. Extensive aging tests have revealed a lower toxicity of waste oils in terms of phosphorus, sulfur or sulphides. At Silkolène, his Moto version in the Advanced Development Project (ADP), was brilliantly led by J. Rowland in 2000 from its Auto version, the Titan GT1. First tested successfully during the 2001 super sport season on the official German ZxNUMXR Kawasaki, she will re-enter the XSLX World Champion Xvumx's Kawasaki ZX9R, Andrew Pitt, and then the GB 6 Superbike Champion (Mr. Hislop). ) and other Ducati! From 2001, ESA was also introduced in the Silkolène range which has even been enriched with the Pro R 2002W2002 rather reserved for competition, given its low viscosity. Now, let's give the floor to John Rowland, the chief chemist of the Fuchs Lubricants research and development laboratory in England, who is behind this breakthrough that is so rare nowadays. JR: "This oil was declined from the Titan GT1 OW20 auto for 4 engines time prepared for the World Superbike in partnership with Kawasaki. Like the GT1 Titan, it is based on special esters and PAOs to combine the benefits of both. This Pro R 0W20 is therefore much more than a low viscosity to avoid film breaks and the usual losses of this type of oil in competition. To avoid this serious problem, we have introduced many additives to reduce friction in the distribution and transmission thanks to an exclusive polymer, very resistant to temperature and shear despite the very thin film, about 100 less than a conventional reference oil. His resistance is comparable to a 10W / 40 or even an 15W50 synthesis API SJ but it saves more between 2 and 5% power! The very low viscosity allows gains on the sparging of the gearbox, the clutch, the pumping, and its greater speed of circulation at equal pressure, better cooled the engine. The current oil pumps are often very oversized and provide a higher flow for the same pressure with motors with small internal clearances so not very kilometers or often redone. Your experience proves that this oil is perfect for the 12 000 km of road instead of the 200 km run but it would be prudent to monitor the oil pressure when the engine ages! 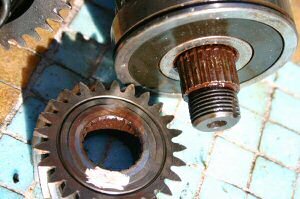 Note also that to obtain a viscosity index above 180, good for the engine, we must use many additives destroyed by the gears of the gearbox motorcycle, which is not the case in cars! 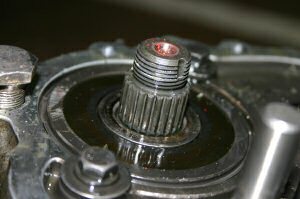 Finally, a clarification on this mysterious ESA: it concerns the lubrication in nonhydrodynamic regime of surfaces such as we can meet between the camshafts and the pushers or between the segments and the cylinders. " MA: "And miracle additives? One more possible? " JR: "For decades, recurring ads have been touting the benefits of this or that extra treatment of your oil or engine with spectacular gains that are supposedly verified. Obviously, we are tempted to believe it! First of all let's think about it: in a 4 gasoline engine, 60% of the initial energy contained in gasoline is lost thermally in exhaust and cooling. On the remaining 40%, between 7% (in city or low load) and 25% finally come out of the engine to attack the transmission. On the remaining 15%, 6% are lost by pumping air at the intake (and especially at low throttle angles) and to ensure exhaust. 6% is lost by pumping liquids and by viscous friction in the oil. There remain 3% losses due to friction. Yes, only 3 small% to win. So it is strictly impossible for an anti-friction additive to do better! 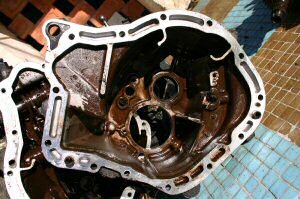 1) Limited-purpose harmless such as, high cylinder lubricants, booster octanes and lead substitutes. 2) Harmless but perfectly useless such as magnetic systems, ceramic coatings and other alloy balls immersed in fuel. 4) Very aggressive and therefore worse than useless: all additives based on Chlorinated Paraffins and silicones in solvents such as perchlorethylene or diluted in mineral oils. These Chlorines cause internal corrosion of the motor elements made of copper-based alloys (brasses, bronze, etc.) or aluminum and accelerates the aging of the oil. Note also that these chlorines produce hyper-toxic hydrochloric acid and organochlorine vapors like the infamous phosgene combat gas! These gases will destroy your catalytic converter or your machine in the medium term. Finally, on a 2 time, the mixture with the oil of the separated or not lubrication, attacks the aluminum of the piston permanently by forming a deposit of chloride of alumium which will entail the tightening! On behalf of Fuchs oils, I formally forbid the use of 3) and 4) additives with our products and declines our responsibility in case. Notice to sorcerers and gullible people of all kinds! " MA "Thank you for this warning that from an expert like you, can not be doubted! As far as I'm concerned, I confirm the breakage of my gearbox of my Citroën BX TZDT under additive after almost 2 years and 20 000 km only! " Thank you for those clarifications, Mr. John Rowland. And this is not the 1ère time an explosive article seems to these subjects because another additive based on the same chlorinated paraffins, ZX1 (or X2S here?) Was tested during 100h 150 ° c with a thickening incredible oil and strong corrosion 3 metal samples that plunge! Another eminent American expert, Maurice E. Lepera, consultant in oils and fuel for the US Army (or chlorinated paraffins are prohibited! ), Confirms these critics in his August article 1998 "Chlorine and engine oils: a good mix ? Once again, it is a NO without appeal. The author even noted that at least 4 additives already proclaimed "without chlorinated paraffins!" ... Case to follow! Close-ups on the crankcase of my former gearbox BE3 / 5 250 000 km out of 5 after a test of "rather" aggressive additive on 20 000 km! A curious blackish deposit and a drain as fluid as water were the early signs of this announced mechanical disaster. But, that's certainly not in the package of additives with chlorinated paraffins! 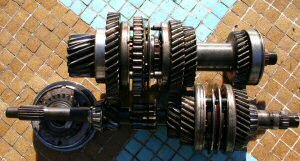 Here are the same elements on the current gearbox BE3 / 5 to ... 160 000 km!